This is a fast growing hybrid of silver and red Maple. This maple can tolerate poor soil and is as drought tolerant as a silver maple. The fall color is a lovely bright red. This is a slow growing Rocky Mnt. native prized for its fall color. They are drought tolerant and alkaline soil tolerant. This is an excellent small single or multi stemmed tree. The winged seeds turn brilliant red in summer. They have good yellow to maroon fall color. Tolerant of alkaline soils. This is a small rounded tree with leaves that start out purple than turn to a dark glossy green color. This is a large shrub to multi stemmed tree with a round spreading growth habit. They have very attractive cinnamon brown bark. They are a native riparian tree. This is a round headed tree with dense branching habit. This tree has a very unique umbrella like growth habit. The Northern Catalpa is a fast growing drought tolerant tree with large heart shaped leaves and vivid white flowers in June. The flowers are followed by long thin seed pods which hold on through winter. This is a large shade tree with upright branches forming a rounded canopy. This has a light green foliage and corky bark. Tolerates heavy soils and dry conditions. This is a selection of hackberry chosen for its blue green foliage and it’s resistance to insects, fungus and other diseases. This is a small rounded tree with lavender flowers in early spring. Heart shaped leaves start reddish and mature to green. Trunk needs protection from winter sun to prevent sunscald while young. This redbud has glossy red leaves in spring that become deep red color in late summer. It has reddish pink flowers in spring. This is a small attractive tree with interesting irregular branches and a broad head. They have white flowers in May are followed by dark red fruit. Great for attracting birds. This thornless hawthorn tolerates city air pollution well. They it has leathery glossy green leaves that turn orange in fall. It has bright red fruit in summer. This is a vigorous disease resistant tree. They have red flowers with white centers are followed by small bright red fruits. 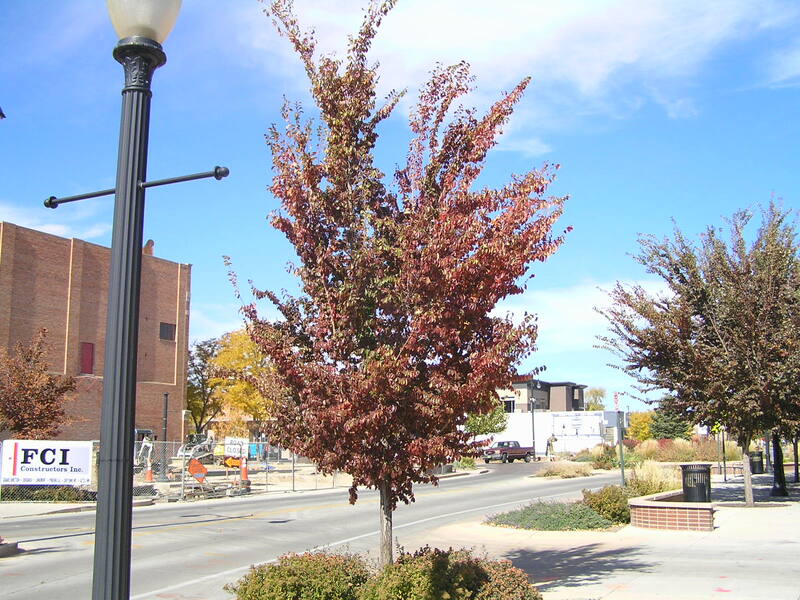 This is a small street tree with glossy green leaves, smooth gray bark, and clusters of white flowers in spring. The red fruits that follow persist into winter. This is a seedless variety of white ash that turns a deep purple in fall. Protect the trunk from winter sun when young to prevent sunscald. Very popular for it’s fall color. This is a small slow growing tree or large shrub native to western Colorado. The rounded leaves are an anomaly for Ash. They are extremely drought tolerant. This is a seedless variety with an upright oval growth habit. Adapts well to adverse conditions. Grows symmetrical and uniform, needing little or no pruning. This is a seedless variety with a rounded crown. Large dark green leaves in summer. Shape is somewhat irregular when young. Good yellow fall color. This is a seedless variety with upright symmetrical branching. It has dark green pointed leaves. A smaller shade tree for smaller areas. Ginkgo is one of the most ancient trees. It is a large spreading tree that works well in street planting and parks. It has beautiful fan shaped leaves. This is a compact form of seedless honeylocust. It has bright green compound leaves that turn gold in the fall. Works well as a smaller street tree. This is a graceful tree with ascending branches and a strong straight trunk. It is seedless and disease resistant. This is a stately tree with uniform branching and dark green leaves. This tree is known for its bright yellow leaves and stems on new growth that turn green as they mature. It has a symmetrical airy growth habit. This is a beautiful columnar tree that is drought tolerant and tolerates poor soils well. It has bright gold flowers in spring. This is a good tree for urban areas and tight spaces. This is a dense upright evergreen shrub to tree native to western Colorado and Utah. They are extremely drought tolerant and alkaline tolerate soils. This is an upright pyramidal evergreen tree with grey green needles and waxy blue berries. Shape varies widely in the species. For a consistent shape, go with one of the many named varieties. The compound leaves, irregular shape, and bold panicles of yellow flowers, make this a unique and desired tree. Add the papery “Chinese lanterns”, heat and drought tolerance, and you have a good street tree or ornamental. This is a broadly pyramidal upright tree with deep corky bark and dense star shaped leaves. The fall color is a mix of bright red, yellow, and orange colored leaves. This tree has square shaped leaves. The older trees produce green tulip shaped flowers in spring. Native to eastern U.S., it grows much smaller and denser in Colorado. This is a fruitless variety with slender cascading branches and dense, glossy green leaves. It is drought and pollution tolerant. Makes a uniquely shaped ornamental as it matures. This is a dense rounded evergreen tree with deep green needles. They are loved for their delicious nuts. They are extremely drought tolerant and they do not tolerate over watering. This is a tall upright tree with a rounded crown. Glossy green lance shaped leaves. They are a fast growing native. They are a great shade tree. Fast growing native tree with a pyramidal growth habit. Needs water to survive! The smallest of the native cottonwoods, growing at the higher elevations. This is a fast growing tree with an irregular growth habit. Fremont Cottonwood is native to the western slope. Very similar to Sargent Cottonwood, but smaller in stature. This is a broad irregularly rounded tree. They have large rich green leaves that turn golden yellow in fall. Native to the eastern slope, it’s the largest of the native cottonwoods. Great shade for large spaces. This is a native tree to the Rocky Mountains, colony forming tree with white bark and golden yellow fall color. Susceptible to leaf diseases at lower elevations. Amend the surrounding soil with lots of course organic material for best results. This tree has fragrant pink flowers in spring followed by maroon red foliage. The foliage fades toward green until fall, when it becomes purple/orange. Works well as a showy specimen or for color contrast. This plum holds its dark purple leaf color all summer long. It blooms early in the spring. Darker than Newport Plum, but not as cold hardy. The new leaves come out bright green, then turn burgundy red as they get older. They have white flowers in spring and followed by dark purple fruit. Great for wildlife. Easier to grow as a clump or multi-stemmed tree. This is a small multi-stemmed tree with a rounded crown. They have clusters of greenish-white flowers in late spring followed by papery seeds in summer that persist through the winter. This is an extremely drought tolerant tree. This is a pyramidal tree with white flowers in spring and glossy green leaves that turn brilliant red in fall. One of the larger flowering pear varieties. This is an upright pyramidal tree. The young leaves have a reddish tint that mature into dark green. Flowering pears are resistant to a wide array of insects and disease. This is a pyramidal tree that is covered with masses of white flowers in the spring. It is very adaptable to city conditions. With the glossy green leaves and narrow growth habit, it makes a great street tree or ornamental. This is a large tree with deeply grooved corky bark. The large leathery leaves turn to brilliant shades of yellow to brown, sometimes red, in fall. Great for a large shade tree. Tolerates heavy soils. A narrow tree for small areas. Medium green leaves turn yellow briefly as they brown in fall and hang on into winter. This is a medium sized ornamental tree. They have large dark green leaves with silver underside. Blooms creamy white in spring and followed by bright orange berries in summer. Tolerates alkaline soils. This is a small sized clump forming tree with compound leaves and white flower clusters in the spring. Bright orange berries through out the summer, followed with yellow to red fall color. Native to our higher elevations. This is a vigorous drought tolerant and disease tolerant tree with a vase shaped growth habit similar to the original American elms.. Introduced by Princeton Nurseries, this tree has beautiful arching branches. It makes a great replacement for elm trees and Ash Trees.